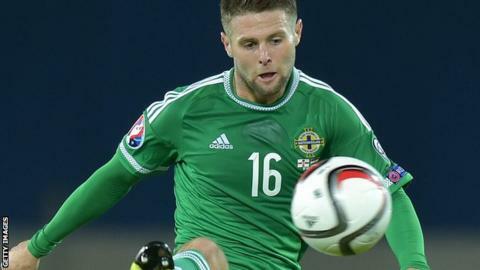 Reading midfielder Oliver Norwood hopes to take his club form into Northern Ireland's crunch Euro 2016 qualifiers. Norwood's country are two points away from reaching next summer's finals in France and face Greece and Finland in their last two group games. The 24-year-old has been an ever-present so far this season in Reading's rise to third in the Championship. "We're quietly confident we can finish the job off against Greece on Thursday," he told BBC Radio Berkshire. "What better way to come back to the club after the international break than qualification?" "Hopefully then we can start kicking on in the league too." Capped 26 times by Northern Ireland, Norwood is expected to retain his place in manager Michael O'Neill's starting line-up for the Group F game against Greece at Windsor Park. "It's been a fantastic campaign, I don't think anyone gave us a chance at the start," he added. "We know what we've got in the dressing room. The manager sets us up with a certain style of play and it suits the players we have. "It's been building for four years now and we're confident going into every game." Northern Ireland have not qualified for a major finals since the 1986 World Cup.